Most people go through periods of feeling unhappy, but when you’re depressed you feel persistently sad for weeks or months, rather than just a few days. The good news is that with the right treatment and support, most people with depression make a full recovery . Depression ranges from mild to severe. At its mildest, people may simply feel persistently low in spirit, while severe depression can make people start to have suicidal thoughts, i.e. believing that life is no longer worth living . If you are experiencing suicidal thoughts, please see our dedicated page for further advice. Most people experience feelings of stress, unhappiness or anxiety during difficult times. A low mood may improve after a short period of time, rather than being a sign of depression. Read more about the difference between low mood and depression. If you’ve been feeling low for more than a few days, you can also take this short NHS test to find out if you’re depressed. Depression, and other depressive mental health disorders, disproportionately affect ‘women of reproductive age’ i.e. anyone with a menstrual cycle. Depression can also worsen at certain times in the menstrual cycle , during or after pregnancy , and at menopause . People taking hormonal medication may also be more likely to develop depression  . Main symptoms: Anxiety; constipation; difficulty concentrating; fatigue; irritability; low libido; lasting low mood, or self-esteem; little interest in activities that were previously enjoyed; muscle aches and pains; sleep problems; suicidal thoughts; tearfulness; and having no appetite or eating too much. Notes: Depression can be hormone-related, or a non-hormonal chronic ill-health condition. Track symptoms over time, and/ or change or stop hormonal medication (under medical supervision), to determine your situation. If your symptoms are caused by your hormonal medication, we suggest that you discuss your options with a doctor. These steps may reduce symptom severity, but are unlikely to be able to stop them completely whilst you remain on the same medication. TOP TIP! If you are also experiencing symptoms of anxiety, make sure you check out these tips and tricks, too. The good news is that the symptoms of depression can respond positively to the four steps outlined on our ‘all symptoms‘ page, whether they are hormone-related, or not. – Try nutritional supplements– A 2016 clinical research review , shows that various minerals are associated with depression, especially; Co- enzyme Q10 ; omega 3 fatty acids (found in fish and some seed oils) ; Magnesium  ; and B-vitamins . Research also shows that Vitex Agnus Castus (200-500 mg of extract daily)  can be beneficial for hormone-related depression. Note: Vitex Agnus Castus is not suitable for those who are under 18; using hormonal medication (or devices); are pregnant, trying to conceive, or breast-feeding; or have a pituitary problem. – Avoid alcohol– As a depressant, alcohol can only make a low mood worse- and excessive use can cause depression, and make suicidal thoughts more likely . 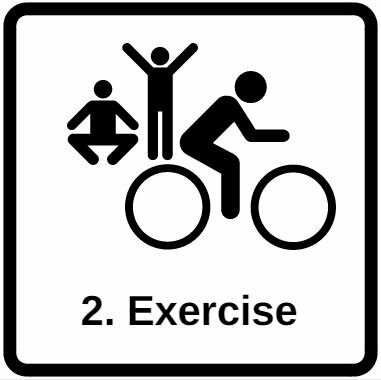 Exercise regularly– Regular exercise, particularly aerobic exercise, may help you combat stress and release tension. It also encourages your brain to release serotonin, which can improve your mood . Research has shown that regular exercise, (more specifically cardio-respiratory fitness), and a healthy BMI (Body Mass Index), significantly reduces the risk of menstrual cycle-related health issues, including low mood . Exercise has also been found to significantly improve mild-moderate depression and so we highly recommend it as a cheap, accessible and empowering approach to managing your own health and well-being. Find out more about starting exercise and exercise for depression. 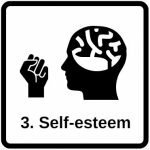 Boost self-esteem- Low self-esteem has been found to increase the risk of developing depression, so it’s worth making sure that your self-esteem is OK, and if not, to do something about it . Cognitive behavioural therapy (CBT) is one of the most effective treatments for depression, and building self-esteem, and is available on the NHS. Research shows that the benefits of CBT may last longer than those of medication, although no single treatment is best for everyone. CBT helps you to understand how your problems, thoughts, feelings and behaviour affect each other. It can also help you to question your negative and anxious thoughts, to improve the way you see yourself, and reduce damaging internal thought processes. CBT usually involves meeting with a specially trained and accredited therapist for a one-hour session every week for 10-12 weeks . Note: The Oxford Cognitive Therapy Centre produces highly effective (and cheap!) booklets on managing the symptoms of low self-esteem and depression through Cognitive Behavioural Therapy (CBT) approaches; e.g. ‘Building self-esteem‘ and ‘Managing depression‘. Reduce stress hormones- Research shows that Mindfulness-based Cognitive Behavioural Therapy (MCBT) is highly effective in reducing menstrual cycle-related low mood, anxiety, and other symptoms  . Mindfulness works by focusing your awareness on the present moment and by acknowledging and accepting certain feelings. Being mindful can teach you how to overcome negative thoughts – for example, being able to challenge hopeless feelings. This practice has been found to reduce ‘stress reactivity’, stopping the vicious cycle of low mood and anxiety constantly triggering the ‘fight or flight’ HPA (Hypothalamic Pituitary Adrenal) stress response- leading to further anxiety (and, therefore, hormone-related symptoms) . MCBT usually involves meeting with a therapist for a one-hour session every week for three to four months . You may find relaxation and breathing exercises helpful, or you may prefer activities such as yoga or pilates to help you unwind- recent research found that, in adults with mild-to-moderate major depression, an 8-week hatha yoga intervention resulted in statistically and clinically significant reductions in depression severity . Counselling/ support groups– it is very important that you talk to others if you think you might be depressed. Doctors, professional counsellors or support groups can give you advice on how to manage your symptoms. Support groups are also a good way to meet other people with similar experiences. They can often arrange face-to-face meetings, where you can talk about your difficulties and problems with other people. Many support groups also provide support and guidance over the phone or in writing. Ask your doctor about local support groups for depression in your area, or search online for mental health information and support services near you. Skovlund CW, Mørch LS, Kessing LV, Lidegaard Ø. (2016) ‘Association of Hormonal Contraception With Depression’. JAMA Psychiatry Nov 1;73(11):1154-1162. doi: 10.1001/jamapsychiatry.2016.2387. PubMed PMID: 27680324. Lee JY, Park YK, Cho KH, Kim SM, Choi YS, Kim DH, Nam GE, Han KD, Kim YH. (2016) ‘Suicidal ideation among postmenopausal women on hormone replacement therapy: The Korean National Health and Nutrition Examination Survey (KNHANES V) from 2010 to 2012.’ J Affect Disord. Jan 1;189:214-9. doi: 10.1016/j.jad.2015.09.068. Epub 2015 Oct 3. PubMed PMID: 26451506. Rajizadeh A, Mozaffari-Khosravi H, Yassini-Ardakani M, Dehghani A. (2017) ‘Effect of magnesium supplementation on depression status in depressed patients with magnesium deficiency: A randomized, double-blind, placebo-controlled trial’. 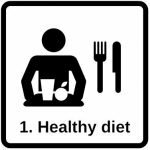 Nutrition Mar;35:56-60. doi: 10.1016/j.nut.2016.10.014. Epub 2016 Nov 9. PubMed PMID: 28241991. By following these 4 steps, you can significantly improve your hormonal health and wellbeing, without medication. Anxiety causes people to be in a constant state of high 'danger alert'; feeling panicky, nervous, or worried. The symptoms of asthma are strongly related to the hormones involved in the menstrual cycle, or hormonal medication. Hormone-related bloating can refer to water retention, or trapped gas/ wind in the gut. Breast pain- also known as mastalgia- is very common, & usually caused by the menstrual cycle, or hormonal medication. Chronic fatigue syndrome (CFS) causes persistent fatigue (exhaustion) and may be triggered, or worsened cyclically.